Factory installed vehicle security does not provide the protection to keep your vehicle and its contents safe. A car gets stolen every 26 seconds, make sure you're not a statistic. According to the FBI, nationwide in 2006 there were an estimated 1.2 million motor vehicle thefts, with property losses estimated at $7.9 billion, averaging nearly $6,650 per stolen vehicle. And that doesn't take into account the value of contents stolen from vehicles ($1.3 billion) plus accessories like wheels, airbags and headlights stolen off vehicles (nearly $530 million). Erickson is an authorized installer of Viper Security Systems. The bright blue flashing LED next to your mirror or on your dashboard, and the Viper sticker on your window lets thieves know your car is protected by the best-selling security system in the world. Experienced thieves don't want the hassle ? they typically move on to an unprotected vehicle. The Viper system detects blows or impacts to the vehicle with the dual-stage Stinger? DoubleGuard? shock sensor, which is sensitive enough to distinguish a light touch (which elicits siren chirps) from an aggressive intrusion attempt (which provokes the full wrath of the Revenger? 6-Tone Siren). Every Viper security system comes with the Failsafe? Starter Kill, designed to prevent "hot wiring" and to keep your car where you parked it. The combination of the shock sensor, siren and starter kill immobilizer provides multiple layers of protection against content theft and auto theft. 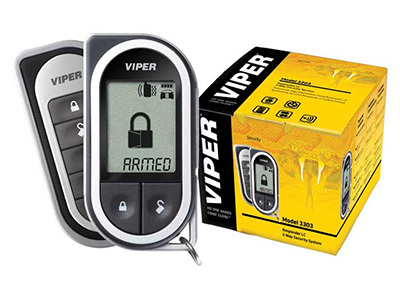 Visit Viper's website for more security products and information.